11/22/07 - December is a Busy Month! Busy, busy, busy is the month of December. Members of the Gilford Historical Society are looking forward to the Gilford Middle High Craft Fair on Saturday, December 1st. Like everyone e lse, we enjoy browsing the craft tables, buying those special gifts, tasting the unique dips on either pretzels or crackers, and especially greeting our neighbors and friends. 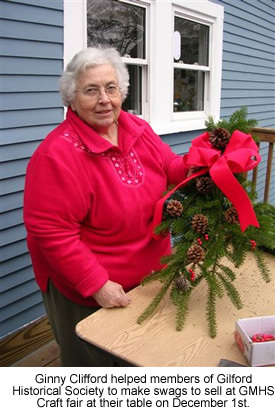 Once again, the Gilford Historical Society will have a table where we will be selling swags, thanks to Ginny Clifford and her willingness to help our members make them. Last year so many of her former clients came to buy them that we sold out; this year we plan on making more. Our table is located in the hallway by the stairs, near the Middle School lunchroom, so we have plenty of room to display Ginny’s swag and that allows you to have a wide variety to pick from. There will also be copies of Gilford’s Gunstock Parrish book for sale. If you are new to Gilford this is an excellent way to get acquainted with our history, plus, they make a great Christmas gift. Thanks to Ginny Clifford, we also have a wide assortment of doll outfits. Each one is unique, there are no two alike. We enjoy visiting with everyone who stops by the table. . The next day, on Sunday afternoon, December 2nd from 1:00-4:00, will be the first of the Rowe House Open Houses. The Dickens’ Christmas Scene will be set up in the dining room, complete with lights, and it is even larger now than it was last year, more details will be added. Once again, in the kitchen, boys and girls will be able to decorate sugar cookies (to eat there or take home). The parlor will once again be home to the Christmas tree. New this year will be a special exhibit of toys from yesteryear. Thanks to Denise Sanborn and her students in the GMHS Chorus, there will be live music to enjoy. On the third day, Monday evening, December 3rd, at the Meetinghouse at 7:00 pm there will be a brief business meeting followed by a special program presented by Darryl Thompson on a “Shaker Christmas”. He “has known the Shaker story from both academic study and personal experience. He holds two degrees in American history from the University of New Hampshire. His father, Charles “Bud” Thompson, lived among the Canterbury Shakers for over three decades, lectured on Shaker history throughout the Northeast, and with Sisters Bertha Lindsay, Lillian Phelps, and Marguerite Frost, founded the museum at Canterbury Shaker Village that gradually evolved into a major historical restoration. Darryl has had over thirty-one years of continuous residency at Canterbury Shaker Village-living there full-time for six years and part-time for twenty-five and one half years. Darryl and Bud were among the consultants used by Ken Burns in his documentary film The Shakers: Hands to Work, Hearts to God, (Walpole, NH. Florentine Films, 1984). Darryl currently works as a historical interpreter and historian at Canterbury Shaker Village. He has lectured widely about the Shakers, authored articles about them, and taught mini-courses and Elderhostel courses on Shaker history.” The program is free and open to all who are interested in learning more about the Shakers from a person who lived in the Village and knew the last three remaining Shakers there personally. We give thanks to the Pardoe Fund for making this program possible. On Sunday, December 9th, in front of the Meetinghouse in Gilford Village at 2:00, the tradition of the Living Nativity will continue. Young and old alike will be able to enjoy the pageant of the first Christmas, complete with oxen, donkey, and sheep. This is a cooperative effort, thanks to the Gilford Community Church, the Methodist Church, the Gilford Historical Society, and local townspeople. Afterwards, all are invited to come inside the Meetinghouse for hot mulled cider and refreshments. Besides the above mentioned four activities, four groups of Brownies and Girl Scouts will be given tours during their regularly scheduled den meeting times, plus two other groups that have indicated that they would like to visit at two other times. If you would like your club or organization to have a special Holiday Tour of the 1838 Rowe House, give Kathy a call at 524-3390. Our members are looking forward to a busy, busy December and would like to share our love of our heritage with you. For information concerning Gilford’s Historical Society, go to www.gilfordhistoricalsociety.org or e-mail at thoames@worldpath.net.